Welcome to South Korea’s real-life SimCity: Incheon. Since 2003, it has been home to Korea’s first Free Economic Zone (FEZ), a specially designated area where companies are lightly taxed or not at all to foster business growth and urban development. Songdo, Cheongna and Yeongjong are three cities that all contribute a specialized industry to Incheon. Songdo in particular possesses a high-tech information service industry. And within that industry, there is a special facility – the Incheon Free Economic Zone (IFEZ) U-City Integrated Operation Center. It is the world’s largest integrated urban operation center. 38 staff members operate the whole facility, but only 16 supervise the hundreds of multicolored digital displays in the main monitoring room. Behind a transparent barrier, visitors can see employees scrutinizing public city life behind their computer screens. Visitor photography is allowed, but zooming in is not permitted – the privacy of citizens within those computer screens is of the utmost importance. Constructed by eight engineers, this technology gathers information about city life. Traffic flow, disaster prevention and pollution control are only some of the city operations under the center’s watchful eye. Sharp enough to identify license plate numbers from yards away, the center monitors public transportation 24/7 with 364 security TVs and cameras. It also alerts severe traffic congestion or automobile accidents to staff members, who in turn can relay the information to police. But the hours of video footage are not stored forever. 30 days after each video is recorded, it is destroyed. 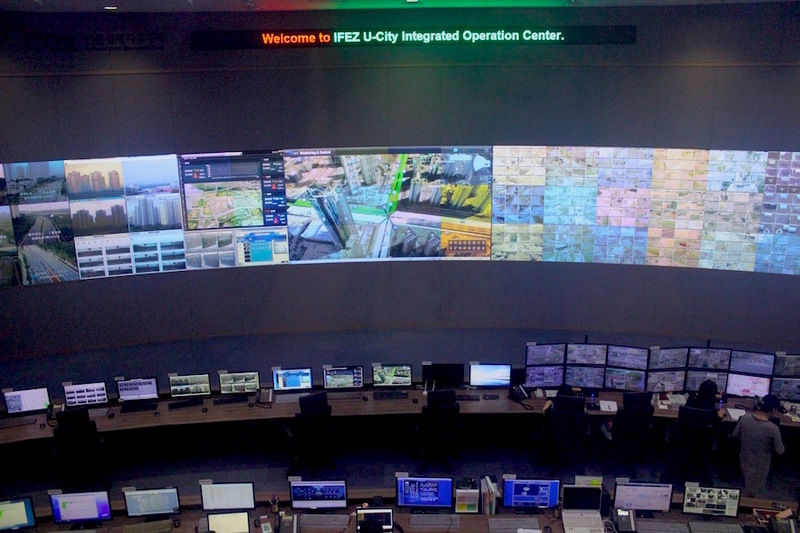 The IFEZ U-City Integrated Operation Center is also part of the “ubiquitous city” of Songdo, a place where data is shared among all of a city’s major information systems. This coordination allows the efficient management of factors like energy consumption and traffic, yet it raises concern about privacy in the face of constant public surveillance. Songdo is the first city to completely embrace the concept of a U-city – not just in South Korea, but worldwide. By the end of 2016, the center aims to possess 500 security cameras that will stand guard on all three islands. By then, IFEZ will be one step closer to reaching its main goal: becoming the ultimate Business Hub of Northeast Asia.